The Gross National Happiness Commission (GNHC) received a cheque of Nu.385 M for the second batch of Small Development Projects from the Indian government. 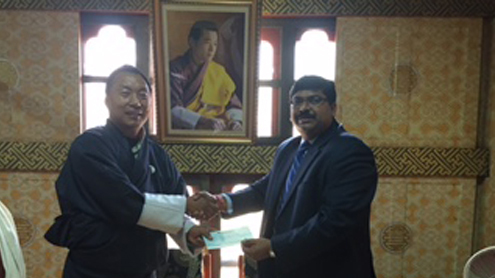 The cheque was handed over by the Deputy Chief of Mission of Indian Embassy, Bishwadip Dey to the GNHC’s secretary Sonam Wangchuk on Wednesday. Government of India has committed Nu.8.5 B for Small Development Projects under 11th Five Year Plan. Of the committed amount, the Indian government has released Nu.936 M.
In total, 303 Small Development Projects worth Nu.4.5 B has already been approved.